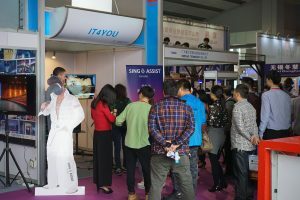 Guangzhou, China, March 14, 2016 /ChinaNewswire.com/ - The new Sing Assist Karaoke application was presented for the first time at the China KTV & Disco & Bar 2016 Exhibition in Guangzhou, which took place on March 9–11, 2016. The art of singing is virtually as ancient as modern civilization. Everyone likes singing, but relatively few people have vocal skills. Today, due to the development of the new voice technologies, the secret dream of anyone — to sing like a professional — can come true. The "My Way" killings are a sadly remembered phenomenon in Philippines when poor performance of the song of the same name resulted in scuffles, and even murders. Between 2000 and 2010, there were more that 15 incidents and 6 deaths there. A lack of vocal skills has led to bad consequences; however, the singing processor of the new generation guarantees that the story will never happen again. The new software developed by IT4YOU compares the source parameters of the voice with the selected tune in advance, which then automatically gives the performer a matching required pitch. Any signal can be represented as a mathematical model. The task of the singing processor is to adjust the voice of the performer to the required parameters of a particular song. Due to the patented algorithms of smoothing of enhanced singing, the voice remains natural. Unlike many other voice technologies, the new application does not require any preliminary training of the system. So the user can start singing immediately after he has selected the song. The singer's voice processing takes place on a real-time basis. The technology guarantees enhancement of the vocal performance, actually synthesizing the voice of the singer. At the same time the synthesized voice is overlayed to the music. Sing Assist Karaoke also has optional functionality: it will be possible to share personal hits in the largest social media and in its own social community. Implemented processing of sing assistant and special graphic illustration of singing will give a user possibility to improve singing ability and learn peculiarities of unknown songs. Sing Assist Karaoke is also a great solution for KTV clubs. With the new application, visitors will be singing more willingly and will not be shy, and the listeners will start really liking their performance. The new technology of ideal vocal creation guarantees the enhancement of the vocal parameters of any singer, even if they have speech defects. Also a new possibility of evaluation of singing will appear in KTV clubs: singing performance will be compared over the entire network. It will allow KTV bars' lovers to compete with each other, even if they are in different cities or countries. KTV visitors will be singing as best they can, but will sound like stars. Special effects, which will be available even without involvement of a sound engineer, will add zest to the modified voice. Some of the effects are new, and some are well-known, including backing vocal, choir, fading, echo, etc. The new software will allow singers to perform songs with all their heart, without troubling about the quality of singing. The application will make sounds perfect, and event maybe better than the original singing. Sing Assist stands a good chance to become the most desired product among karaoke lovers.